The compact design of the Dingo Breaker makes it the ideal companion to the Dingo. Tools available include the standard moil point, narrow and wide chisels (the wide chisel also being known as an asphalt cutter. Breaking rocks in trenches and in post holes (large rocks that the trencher or post hole digger cannot bring up easily. and all kinds of demolition work. The Dingo Breaker comes standard with a moil point. Used For: Breaking concrete, rocks, brickwork, chiselling tiles, cutting asphalt etc. 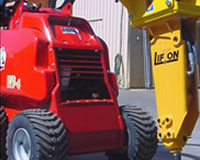 Used By: Mines, Hire companies, Contractors, Builders, Plumbers, Earth moving Contractors, Floor Preparation Contractors, Paving Contractors, demolition contractors.